Could “Why” be the BRMs Access into the World of Strategic Partnership? Being a self-confessed Ted Talk addict, I go through countless Ted Talks for inspiration. Some stick more than others, but one of the Ted Talks that I found extremely useful was Simon Sinek’s How Great Leaders Inspire Action. In his talk, Simon stresses the importance of knowing your “Why?” to inspire action and support for a vision. To explain his concept, Simon Sinek developed what he called the Golden Circle. Subsequently, he explains how the “Why?” is the core of the business and defines its existence. By viewing the Business Relationship Management (BRM) Institute’s Relationship Maturity Model through a Golden Circle lens, one may begin to visualize how this concept could lead BRMs towards successful strategic partnerships. 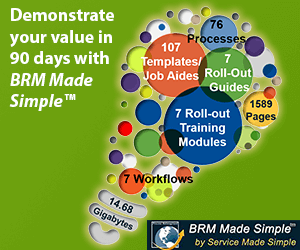 As BRMs move through the various levels of relationship maturity as set forth by the BRM Institute, transitioning from an Order Taker to a Service Provider usually feels a lot like a hop. While moving from a Service Provider to a Trusted Advisor gets slightly harder and feels more like a jump. Taking the relationship to its highest form from a Trusted Advisor to a Strategic Partner seems to be the most difficult to achieve, and feels more like a huge leap. It is also the hardest to sustain once achieved. The key element to help BRMs make that leap into the Strategic Partnership realm is the ability to lead the discussions and focus on answering the “Why?”. Because here we find the closest alignment to the core of the business, and therefore the minds of business executives. This may be easier said than done. Because many organizations focus their IT conversations on how things should get done. Thus, people seldom start with the common understanding of how IT can contribute to the organization’s raison d’être, given that IT is often viewed as a support service. So, the next time you are searching for a way into the super elite world of strategic partnerships, consider investing some time answering the “Why?” question. And direct your strategic relationship building into the Golden Circle of Simon Sinek. Strive to find a common purpose with your partners to inspire action and help sustain your elite status when the stakes are high.